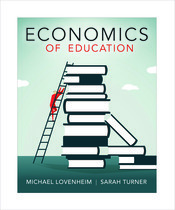 While there are many great research articles, good books, and provocative policy analyses related to the economics of education, these materials are often written to influence the policy process and not necessarily for students with limited knowledge of the underlying policies and the economic framework. This textbook is intended to serve as a foundation for a broad-based course on the economics of education. Its goal is to provide an overview of economics of education research: to lay out the evidence as clearly as possible, note agreements, disagreements, and unresolved points in literature, and to help students develop the tools necessary to draw their own conclusions.